On my latest adventure to my favorite fabric store in the world, Habermans, (why oh why do you have to be over 600 miles away!) I bought myself a few pieces of silk. 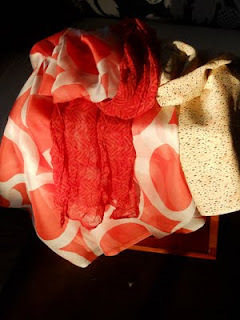 After a few hours of hand stitching, I now have three new scarves. I also got a couple pieces of 100%wool but you'll have to wait to see what I make out of those.